In German households every day about 3 hours artificially generated light is required. If we could reduce the power consumption for lighting by about 75% so 10 terawatt hours could be saved annually. This corresponds roughly to a nuclear power plant electricity production. Reducing power consumption is still reflected in the increased demands on the climate as a useful measure. The legislators have already responded and decided to use more eco-friendly bulbs. A modern energy-saving bulb uses about 80% less power than a standard bulb for the same performance. In addition to Saving power, the power-saving lamp also has a higher light output with less heat loss and a longer lifetime. To ensure the environmentally sound disposal, low-mercury amalgam technique is used in this lighting technology. 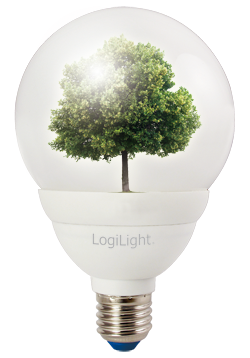 LogiLight has developed an innovative range of products that meets the requirements of our mission. The bulbs meet the latest technology in the design of a traditional bulb, they hardly can be differentiated. With the energy meter, you always have control over your power consumption.